Leaving your precious baby in the care of another person is difficult; who can you trust to look after your child? I know how you feel, our oldest two childen were placed in child care at the tender age of six weeks old, and I promise to love and care for your child as if he or she were my own. My infant and toddler child care program provides a warm, nurturing atmosphere where your child will learn, play and grow. Children who are two weeks to two years old are eligible for infant and toddler child care. Enrollment is on a first come, first served basis, and due to the caregiver/child ratio of one to four, openings are often scarce. It is best to contact me as soon as you anticipate needing infant or toddler child care. 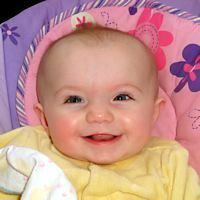 Infants and toddlers are very young; their brains are still developing and they're just beginning to learn about the world, so they they require a special program designed to meet their unique needs. The infant and toddler child care program at Amy & Kids Co. is designed to promote the development of secure attachments while meeting the individual needs of each child. A comfortable, nurturing environment that promotes secure attachments. A sensitive and responsive caregiver trained in the unique needs of infants and toddlers. A bright, cheerful environment with developmentally appropriate toys and materials. Cozy and safe sleeping space within sight and sound at all times. Continuity of care in the same familiar setting with the same caring person every day. Plenty of cuddling, rocking, singing, speaking with and being read to. A daily routine that balances teacher and child-initiated experiences. Opportunities to participate in activities with the other children as appropriate to age and development. A daily report detailing the child's eating, sleeping, diapering, activities, and mood throughout the day. Social and friendly mealtimes determined by the child's need, not an arbitrary schedule. Gentle guidance in acquiring social skills as appropriate. Full time schedules are preferred for infant and toddler care, due to licensing ratios that limit the number infants and toddlers a program can enroll, however part time schedules may be available under certain circumstances. See what openings are currently available, then check out the child care schedule page for information about infant and toddler schedules. Tuition costs for the infant and toddler child care program depend on your contracted schedule. Tuition costs are the same for infants and toddlers from two weeks to two years old. Families with older siblings enrolled in my program will receive a discount on the oldest full time child's tuition. Please visit the child care pricing page for complete tuition information. Amy & Kids Co. Family Child Care is licensed in Wisconsin througn the Department of Children and Families (DCF) The infant and toddler child care program is governed by program policies and the following infant and toddler child care policies, which fulfill DCF requirements for infant and toddler care in licensed family child care programs. Amy & Kids Co. is proud to be the first family child care program to earn the Breastfeeding Friendly Child Care Center designation in Outagamie County. Breastfeeding has been shown to be the best form of infant nutrition, providing a multitude of health benefits to both child and mother. Mothers who are able to breastfeed their children are encouraged to do so for as long as they desire. As a mother who breastfed all of my children, I am eager to provide the support you need to continue your breastfeeding relationship with your child while he/she is in my care. If possible I will hold off giving a bottle when you are due to arrive, will only use a pacifier at your request, and will not offer formula or solid foods unless you request their use. To make the transition from home to child care easier for your child, please be sure your child is accustomed to feeding from a bottle before his or her first day in care. You are welcome to come and nurse your baby at any time of the day. Breastfeeding mothers will be provided a clean private place with access to an outlet, comfortable chair, and running water for nursing or expressing milk. Space in the freezer and refrigerator will be available for expressed milk; please provide your own containers labeled with name and date. I am trained in the proper storage and handling of breast milk, as are any substitute or additional caregivers. All breast milk should be sent in tightly sealed containers labelled with the child's name and the date it was pumped. You may send frozen breast milk or a container of refrigerated breast milk to be prepared as needed for feeding, or you may choose to send ready-to-use bottles from home. Ready-to-use bottles should be packaged in ziplock baggies to prevent spills. Please be sure your child will have an adequate supply for the day; if sending ready-to-use bottles please send a back-up supply to be kept in the freezer in case of extra-hungry days. All bottles must be labeled with the child’s name; ready-to-use bottles from home must be labeled with the date in addition to the child’s name, and taken home daily for cleaning. Breast milk will be warmed in warm water; a microwave will never be used to warm breast milk. I am in contact with local breastfeeding support and keep a resource file of up-to-date information about breastfeeding and area breastfeeding resources. This information is available to all families, whether they choose to breastfeed or bottle feed. In addition, toys and books that promote breastfeeding and portray it as normal are constantly available for the children's use. I use the Paced Bottle Feeding method with formula-fed babies also. This method gives your baby time and space to eat at his/her own pace and encourages baby to be in charge of the feeding. In order to provide the cuddling benefits of breastfeeding, bottles will never be propped, and young babies will be held closely when being fed. As older infants develop the ability to hold their own bottles they will be allowed to do so in order to make the transition to a sippy cup easier. Children of all ages will not be allowed to walk around and/or lie down with bottles or sippy cups. Bottles will be made as needed for feeding, or you may choose to send ready-to-use bottles from home. All bottles will be labeled with the child’s name; ready-to-use bottles from home must be labeled with the date in addition to the child’s name, and taken home daily for cleaning. Infants are included in the Child & Adult Care Food Program beginning on their first day of care. According to Food Program regulations, children under one year of age must be served breast milk or iron-fortified formula unless written instructions from the child's doctor are on file. Amy & Kids Co. offers Target Up & Up Premium brand formula, however you may choose to provide your own formula if you prefer a different brand. All parents of infants must fill out the "Parent/Provider Infant Formula Agreement" to specify if breast milk or formula is to be served to their child. Infants daily routines will follow their individual needs. Each infant will be fed when he/she is hungry and placed down for a nap when he/she is tired. Beginning at 12 months, toddlers' routines will slowly be integrated with the older children's routine. Infants who are not mobile will be placed in different positions throughout the day and brought into different areas of the child care environment. Mobile infants and toddlers will have a clean, safe place to practice crawling, cruising and walking. Children of all ages will receive individual attention including lots of time for talking, cuddling, and playing with a wide variety of safe toys and objects. All diapered children will be changed when they are wet or soiled. Since diaper changing is considered part of the daily routine, the child being changed is involved in the activity through conversations about what is happening, as well as holding and handing the clean diaper to me. Many families choose cloth diapers and wipes because they are better for the environment, prevent diaper rash, save money, and do not contain chemicals. 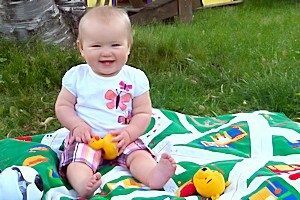 Please let me know if you'd like information about the environmental, health and financial benefits of cloth diapering. I have used both cloth and disposable diapers on my own children, am familiar with different diapering systems, and am willing to work with whatever system you choose. The changing table is located in the playroom where I can change diapers while remaining with the children. Adults'' hands are always washed before and after a diaper change, the child's hands are washed after a diaper change, and the changing surface is cleaned and disinfected after each use. There are cubbies above the changing table for the storage of your child's diapering supplies; please check supplies frequently to ensure that your child has an adequate amount. In order to help prevent the tragic occurrence of Shaken Baby Syndrome, I have received SBS prevention training, as have any volunteers or substitutes. I will never shake or roughly handle any baby or child in my care. In addition to many years of experience soothing crying babies and upset children while remaining calm, I have resources to turn to if needed. Rest assured that your child is safe in my care. I believe that parents should have the pleasure of introducing new foods to their children so I will not feed any foods to an infant without parental direction. I will work with parents to develop an appropriate feeding timetable based on the child's development, Food Program requirements, and parental preferences. Each infant will be kept on his/her individual feeding schedule. Children under one year of age must be served breastmilk or formula, even in sippy cups, unless written instructions from the child's doctor are on file. Amy & Kids Co. will provide organic iron-fortified infant cereal and organic jarred baby food or baby food made from fresh produce. If you prefer a specific brand or specific jarred foods you may choose to provide food for your infant. 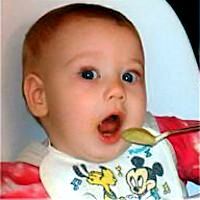 Bibs will be used consistently until children are one year old. Afterwards bibs will be used with messy meals like spaghetti. To reduce the risk of choking, foods that are associated with young children's choking incidents will never be offered whole to children under two. These foods include hot dog and raw carrot rounds, whole grapes, hard pretzels, large chunks of meat or cheese, etc. Food for infants will be cut the size of a pea (one-quarter inch) or smaller, while foods for a toddler will be cut one-half inch or smaller. In addition, children are always seated and closely monitored while eating. In order to help prevent the tragic occurrence of Sudden Infant Death Syndrome, I have received SIDS training and will distribute SIDS materials to all parents of children under one year old. Children under one year of age will be placed to sleep on their backs unless a written note from the child's physician is on file. Soft objects are never placed in cribs, blankets will be tightly tucked around the child away from his/her face, and sheets will be tight-fitting. In addition, if a child falls asleep in a place other than his/her crib he/she will be moved to the crib, and non-mobile children will have play time on their tummies each day. Substitute and additional caregivers will also receive SIDS training before caring for children under one year old. Teething children often feel miserable. To help with teething pain we provide a variety of teethers. We will also administer pain relievers according to the Medication policy. The FDA discourages the use of Oragel and similar products containing benzocaine with children under the age of two. These products may make swallowing difficult and increase the risk of choking or food inhalation, and cause decreased oxygen in the blood stream. Due to these risks we will not use these products on children under the age of two. 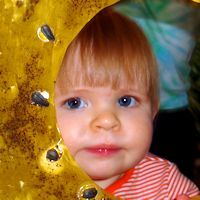 Licensing rules prohibit amber teething jewelry, even if not worn around the neck. Because infants grow and change very quickly the supplies they need change frequently. Your infant and/or toddler needs two complete sets of seasonally appropriate clothing kept at Amy & Kids Co. It is your responsibility to update these outfits as the weather changes and as your child grows. For safety's sake, please do not dress your child in clothing with drawstrings around the neck or allow your child to wear necklaces, including teething necklaces, or pacifiers on strings. Short clips are preferred for pacifiers. Parents must supply diapers or training pants and wipes for their child’s exclusive use. Parents are also responsible for providing bottles for their infant’s feeding, and several pacifiers if used. You may choose to send burp cloths and bibs, or use center-provided ones. 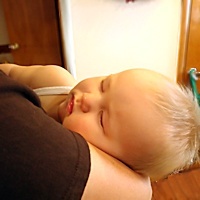 Infants up to 3 months old may be swaddled during naps if they prefer. Please provide the type of blanket or swaddler your child prefers, labeled with your child's name. Please remember to make sure your child has enough supplies each day; I will try to notify you when your child’s consumables are getting low. If consumable supplies run out during the day, Amy & Kids Co. will provide the necessary items for an extra fee. I maintain a small supply of extra clothing in limited sizes. If your child needs extra clothing but does not have any here and center items will not fit, I will call you at work so you can bring the necessary items. Be sure to label all articles with your child's name. I'm always amazed by how quickly tiny infants grow into sturdy toddlers, who soon want to do everything the “big kids” do. Toddlers naturally progress from infant and toddler care to preschool activities when they're ready – usually beginning around two years old. At this point it's sometimes hard to remember how little they once were, and how difficult it was to choose a child care program for your precious child. Other parents are in the same situation you once were in - trying to find someone to leave their precious child with. Your experience can be helpful to them, so if you're happy with the care your infant or toddler has been receiving, please take a moment to write a brief note explaining what you like about the care I provide. Your comments will be published on this website for prospective parents and visitors. Thank you so much!